When a multigenerational family travels together, a safari needs to meet the needs of all of them. The only thing more exciting than going on an African safari is being able to share such an experience with one’s children and grandchildren. That’s why an increasing number of multigenerational families are traveling together on safaris. Granted, it can be challenging to plan a trip for any group of different ages, energy levels, interests and needs—family or not. But part of planning a successful trip is finding the right base for the adventure. Four Seasons Safari Lodge in Tanzania is a rather unique setting for such groups because the property is small enough to feel intimate but large enough to offer choices. Guests can choose from a range of accommodations that include 60 spacious guest rooms, 12 suites with plunge pools, and 5 freestanding villas with private swimming pools. Thus, family groups can opt to reside under one roof (in a villa) or divide up in double rooms or suites. Built in 2009 and rebranded as a Four Seasons property in 2012, the Lodge is contemporary in style, with all its rooms built around a two-story great house. It offers a perfect alternative to luxury tented camps for families who want to experience the African bush but value the safety, security and unparalleled amenities associated with a luxury brand like Four Seasons. Situated at the center of the 5700-square-mile Serengeti National Park in East Africa, the Lodge’s wooden structure blends seamlessly into its natural surroundings. The interiors, furnishings and design elements, too, convey an authentic sense of place that reflects the richness of African culture. The Serengeti National Park is home to 2.5 million mammals, the largest concentration of wildlife in the world. 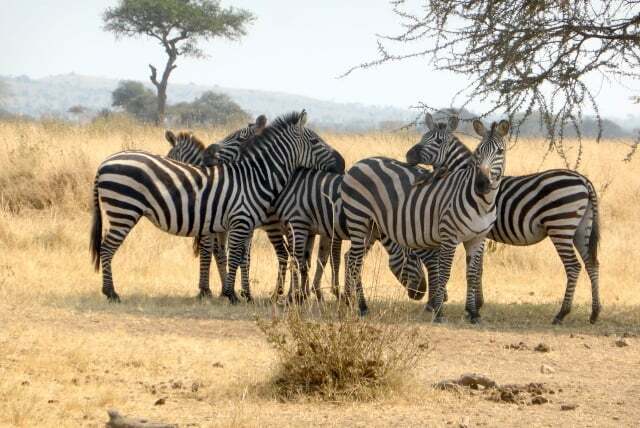 Towards the end of May, this area serves as starting line for the annual wildebeest migration when more than 1.5 million wildebeest—joined by zebras, Thompson gazelles and impalas—begin their trek north to Kenya. Recognized as a national park in 1951 and designated as a UNESCO World Heritage Site in 1981, the park was the inspiration for the smash musical, The Lion King. Perhaps, less well known, it is considered one of the premier bird habitats in the world, home to more than 500 different species. In the Maasai language, the term serengeti means endless plains. That’s an apt description of the vast areas of grasslands and woodlands surrounding the Lodge. Even if some family members are too tired to go out on a bush drive or bush walk on a particular day, they’ll have ample opportunities to observe animals on the unfenced grounds of the property. Wildlife, such as elephants, baboons and buffalos, drink at two watering holes on-premise. Elevated boardwalks wind through the property (which is about 1/3 mile from end to end), leading from the great house to the guestrooms and spa; they offer a lovely (and secure) path for viewing flora and fauna. Each room also has an open-air sundeck with magnificent views so those who stay behind can enjoy a “sofa safari” from the comfort of their rooms. No matter how luxuriously appointed, a tent is still a tent. It can’t be as comfortable and spacious as a guest room at a five-star property with a rich infrastructure like the Four Seasons Safari Lodge. If your clan is used to air-conditioning, good lighting, potable water, high-speed internet access, flat-screen TVs, insect-free rooms that are regularly exterminated, screened terrace doors, large closets, spacious baths, and sitting areas, the Four Seasons Safari Lodge offers each of those comforts and then some. Villas afford closeness as well as privacy for a family that wants to be together in the same space. The units have full kitchens, multiple bedrooms, walk-in closets, outdoor showers and common areas on a grand scale, both indoors and out, for relaxing and sharing adventures. Have health or safety concerns? The lodge has an onsite physician and Maasai (tribesman) security guards to walk beside you in the evenings. The freestanding spa also houses a fitness center. After a long day in the bush, guests can take a dip in the infinity pool or take advantage of Maasai-inspired spa treatments, such as an African coffee body wrap, Kifaa massage or vitamin-booster facials. The six treatment pavilions are set up to provide indoor or outdoor treatments (for singles or couples) with views of the plains and wildlife. Guests are are pampered with Africology and Elimis products. Deciding whether or not to take children on a safari isn’t as straightforward a decision as going to Disneyland or the San Diego Zoo. Parents want to make sure their children (or grandchildren) are old enough to appreciate the safari experience and mature enough to avoid the obvious dangers of the wild. Game drives at the Lodge require that children to be at least 8 years of age; participation in walking safaris on the grounds of the property is limited to children over the age of 16. However, even kids who reach the age threshold can bore easily on long game drives or have difficulty adjusting to early morning wakeups or lengthy, late night group dinners. They may also miss the company of their peers. The Four Seasons Safari Lodge was designed with children in mind. In addition to having all-day dining options, it has a fully staffed, supervised Kijana Kids Klub (open to children ages 8 and up) decorated with native Tinga Tinga art. The property recently opened a unique Discovery Centre, where children and adults can learn about wildlife, the environment, African culture, and conservation through self-paced, museum-quality exhibits and lectures from visiting experts. Teens may also be tempted to curl up on the comfortable sofas in the lounge where they can view a widescreen TV, play games, and simultaneously connect to the Internet wirelessly. The lodge offers three gourmet dining venues. The 50-seat Boma Grill serves African-themed grilled dishes served in a circular room around an open fire pit. Kula’s Restaurant serves American-style sandwiches, pizzas, and salads for less adventurous eaters. Lastly, the Lodge offers a pan-African buffet, including both international fare and popular local dishes like goat stew and ugali (an East African dish made with maize). All the restaurants emphasize local ingredients (such as sweet potatoes, yams, plantains, green beans, carrots, and mangos) from nearby farms and from high-quality food purveyors in Arusha, some eight hours away from the property by truck. The property also has two bars and a wine cellar where guests can partake in a South African wine tasting or a paired wine dinner. The key to a successful multigenerational safari is finding ways to spend together and time apart—and to be able to adjust the balance between adventure and relaxation to everyone’s tastes. Four Seasons Safari Lodge is a perfect launch pad for that. A big thank you to Micato Safaris for introducing to the Four Seasons Safari Lodge. *This link appears on Noel Morata’s photography blog, Travel Photo Mondays. Now, THIS is a great way to enjoy a safari! wow, I’m impressed, looking forward to seeing the safari segment, but wouldn’t mind lounging there for awhile. The Four Seasons is impressive! The Serengeti’s on my list for my next safari. We didn’t have wifi or phones at our tent — the camp believes in being totally disconnected — but all the other luxuries were there. After a few days, I didn’t even miss the Internet. It sounds and looks wonderful – what a great idea to have the whole family go. Looks wonderful. I’d love to stay here when I return to Serengeti. A most interesting and informative post! Loved the photos and the narrative! This place looks fantastic! My friends are planning a safari trip to Tanzania over Christmas. I’ll have to send them this post.